Salvia superstars -- that's what they are. 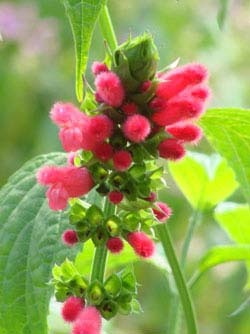 At Flowers by the Sea, we love all our sages (Salvia spp. ), but some of them would walk down the red carpet if they had feet instead of roots. Large or small and whatever their bloom time, these are plants that continually amaze us with their adaptability, beauty, ease of growth, endurance and graceful form. They are our Celebrity Salvias. 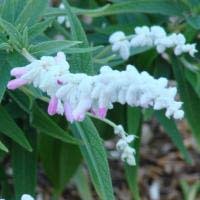 If you want to suggest a favorite that we should light up in the marquee of our Everything Salvias blog, please call or send us a message. We'll consider turning on the Klieg lights and rolling out the carpet. Differentiating between the plants in a closely related group can feel similar to being an outsider attending a large family reunion. Identifying who's who and how they are connected is a challenge. 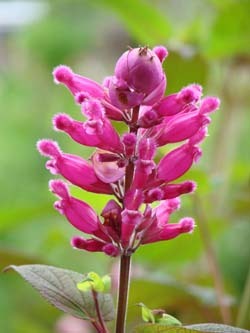 That's the way it is with Mexico's Roseleaf Sage (Salvia involucrata) Group, which is well loved by hummingbirds. One thing that may be confusing about the various cultivars and hybrids in the group is their abundance of puffy, tubular, magenta flowers. 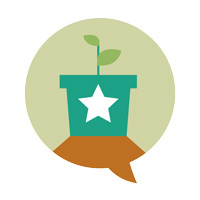 FBTS Online Plant Nursery grows a number of species from the group. Read more to learn about the randy Roseleaf Sage Group that hybridizes freely and includes many species that bloom in in winter. Flowers by the Sea grows a number of native California sages, including threatened species such as the woody perennial shrubs Santa Rosa Island Sage (Salvia brandegeei) and Island Pitcher Sage (Lepechinia fragrans). 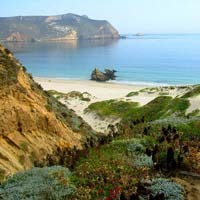 Elusive is one adjective to attach to both plants, because they are rare in their native Channel Islands homelands off the coast of Southern California where they are endangered.